Smart Nationwide Mobile Internet Modernization Reaches Metro Cebu! Home / modernization / news / smart communications / Smart Nationwide Mobile Internet Modernization Reaches Metro Cebu! Visayas region's premier urban hub, Metro Cebu is now feeling the nationwide modernization program of Smart Communications, Inc. In recent internal field tests conducted at key areas of Metro Cebu, download speeds of LTE service jumped 146% to 19.7 Mbps and have reached 52 Mbps in specific areas like Cordova with upload speeds blazing to 134% to 14.3 Mbps. Records of 20 Mbps LTE speeds are seen both indoor and outdoor around Metro Cebu. 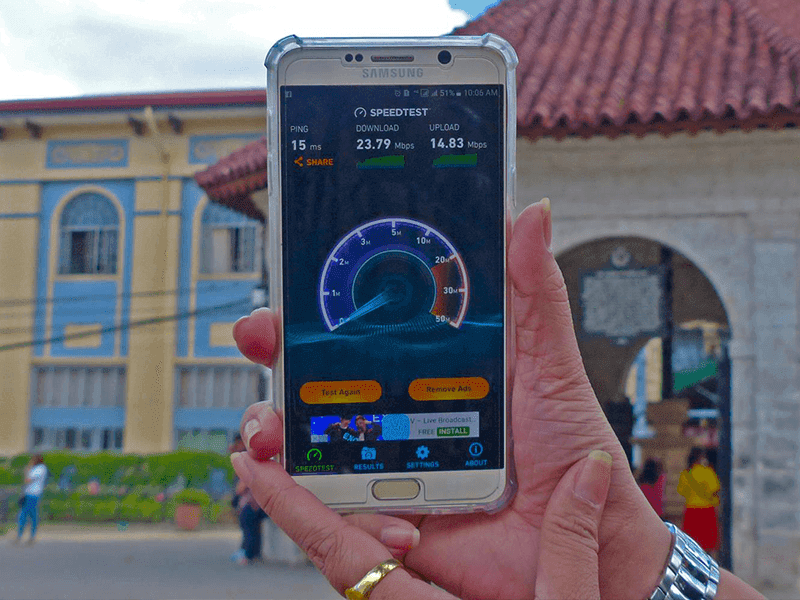 While LTE speeds of more than 21 Mbps is seen around SM seaside Mountain Wing, Lantaw Native Restaurant Mactan, Mactan International Airport and Banilad Road in Cebu city. While at Jollibee Minglanilla LTE speeds are exceeding 37 Mbps! In brgy. Tingub Mandaue City reaching 47 Mbps! On the other hand, speeds in excess of 90 Mbps have also been achieved in and around the Minglanilla Sports Complex, using carrier aggregation (CA) and LTE-Advanced (LTE-A)-capable handsets. 3G service on the other hand multiplied by 275% to 6 Mbps while uploads improved by 45% to 1.6 Mbps. Carrier aggregation refers to the capability of LTE-A to combine two or more radio frequency bands in order to deliver bigger bandwidth and much faster data speeds to mobile users. “We are accelerating the rollout of LTE because it provides an immediate significant boost to the speed, quality and reliability of our service. Moreover, it lays the foundation for the rollout of LTE-A with CA and puts us in a position to further improve internet service as more handsets capable of CA become available in the market,” said Joachim Horn, chief technology and information advisor for PLDT and Smart. “These are just initial results, and we are already nearing the midpoint of our implementation in Metro Cebu,” Horn added. “We are asking for people’s patience and understanding as we make changes in our network facilities. These activities are being done during the most inactive hours of the day, and we are putting systems in place to minimize the impact on our subscribers. In the end, our commitment to all our subscribers is that they will enjoy progressively better mobile data services in the next few months, particularly for those using LTE devices,” said Horn. These improvements are a result of increased 3G and LTE base stations in Metro Cebu, which are up by 16% and 108%, respectively. This translated into LTE and 3G data volume increase via network monitoring data. “In upgrading mobile and data services in Metro Cebu, we are helping improve the quality of life in one of the country’s biggest provinces, where millions work and play,” said Horn. “This progress in Metro Cebu is just a preview of what Smart will be rolling out to the rest of the island and the rest of the country - a fast and reliable mobile data network for all Smart subscribers,” Horn added. With more than 2.8 million Filipinos residing in Metro Cebu and with passenger arrivals at Mactan-Cebu International Airport hitting nearly 9 million last year along with being the largest outsourcing destination outside of Metro Manila.